ORDER YOUR TICKETS ONLINE RIGHT NOW! A+ Rated BBB company with NO HIDDEN OR TAIL END FEES! Any order for 5 or more tickets will be broken up, ie: 3 + 2. Contact our office for more info on larger group orders or for odd amount orders. Unless otherwise noted, all seats will be side-by-side. Events start at 6:45pm. Prices subject to change at any time. 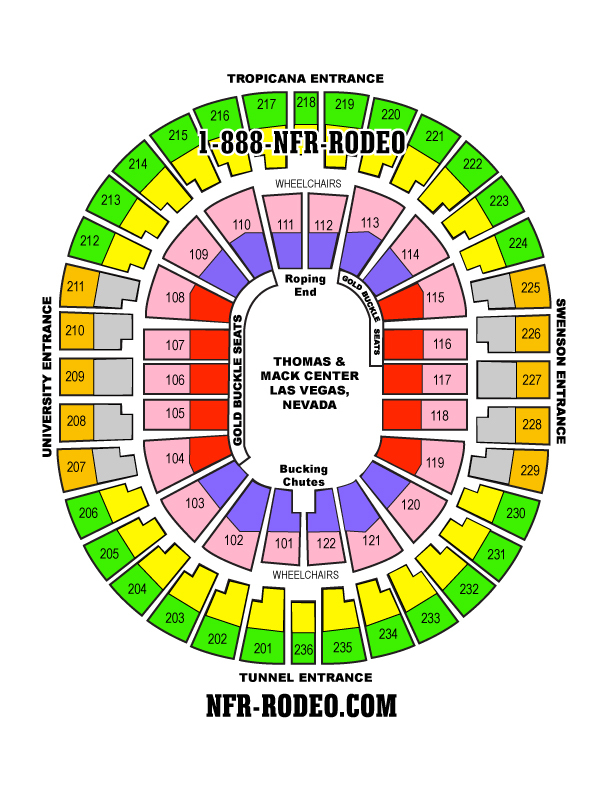 Exact seat locations will be determined in November after NFR Tickets are printed. You are guaranteed to be in the category you have ordered. Paying well over face value. Call or Email us! LOOKING FOR GOLD BUCKLE OR PREMIUM LOW ROW CENTER PLAZA SEATS? ONLY POSITIVE REVIEWS BY OUR CUSTOMERS FEEL FREE TO GOOGLE OUR COMPANY AND SEE! Disclaimer, PLEASE READ BEFORE ORDERING!!! First Choice Tickets, Inc is an independent, privately-owned licensed company engaged in the business of buying and selling Premium tickets or seats for events that are "SOLD OUT" through the arena box office. Please Note: Our office does not charge FACE VALUE and we are NOT the NFR Box Office. We are in no way affiliated with Ticketmaster, The P.R.C.A., any theatre, box office or arena. All and any copyrights, trademarks, trade names used within this web site are for descriptive purposes only. We are not acting on the authority of or by the permission of any of the above mentioned entities. We are able to provide access to tickets for events via over 20 years of contacts. Most tickets sell for above face value, at market value, this reflects the degree of difficulty, and, of course the cost of obtaining tickets from our sources. All tickets sold are 200% guaranteed to be authentic. All prices quoted by First Choice Tickets include all service charges and reflect the cost of obtaining quality seating, or seats in limited supply (usually to "Sold Out" events) *WE DO NOT CHARGE FACE VALUE ON EVENTS WITH HIGH DEMAND, LIKE THE NFR RODEO. First Choice tickets reserves the right to cancel an order if there is an obvious pricing or technical issue within the programming of our website.